Nature connects us to the deepest part of our soul, sending visual healing to our hearts, showering us with the gift of love for ourselves & the world around us. with the gift of love for ourselves & the world around us. Louie has received thousands of heartfelt and personal messages from people around the globe who have expressed the profound impact of his Visual Healing. This is an area where we have merely touched the surface of what is possible, and we actively engage partners who share our desire to demonstrate the scientific and medical benefits of visual healing. Visual Healing is a virtual immersive program of Moving Art by Louie Schwartzberg, availing his stunning award-winning body of work collected from over 40 years, to health and wellness institutions and organizations wanting to bring a sense of natural wonder, healing serenity, restoration and well-being to their environment. Select from a vast library of every natural environment that exists on land, sea, and air, following the passage of the sun, the stars, and across intimate cityscapes, in speeds both faster and slower than the human eye can see. Louie remains at the cutting edge of exploration in this area and applications prove endless with significant possibility. Patients are provided a tablet by their bed where they are given the power to choose where in the world they want to be healed. The choices for their own visual healing experience include desert, ocean, flowers or forest. 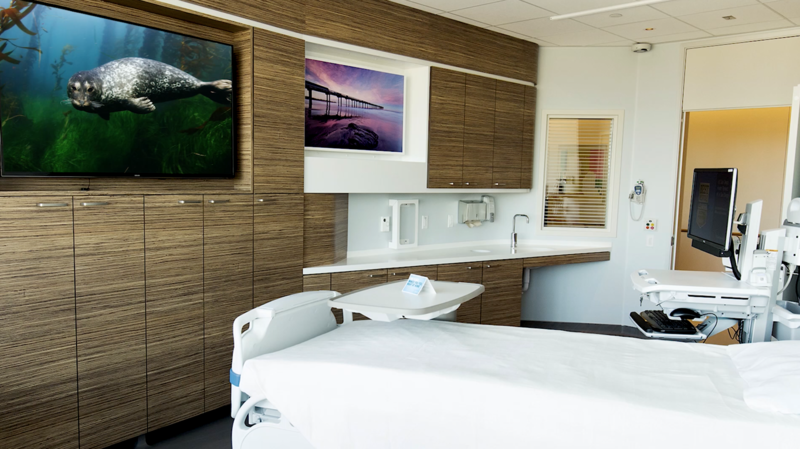 Currently at the brand new state-of-the-art UCSD Jacobs Medical Center in all 249 rooms, this forward-thinking facility is collecting data to see how visual healing reduces heart and respiration rate, pain killers, and improves sleep. We are giving patients the power to choose, when choice has been taken away from them.